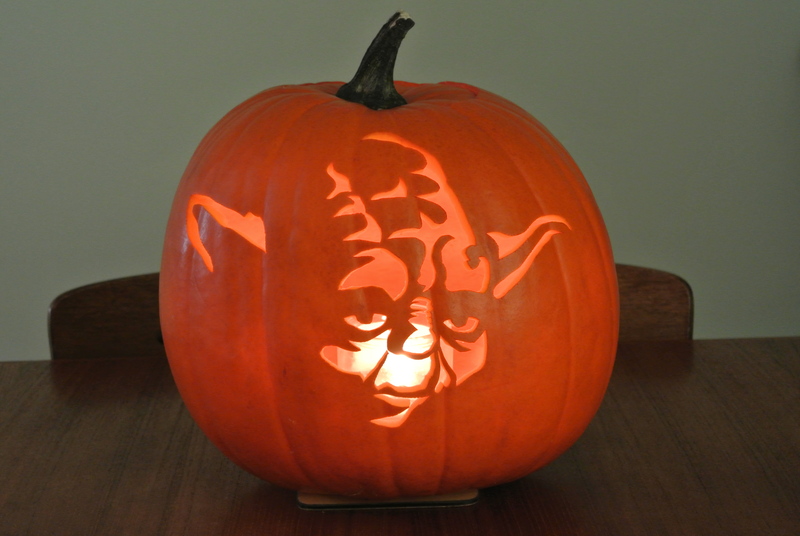 A fun pumpkin to carve, this was. When I have a long list of things that I should be doing, the last thing I want to do is ANYTHING on that list. That definitely seems to be the case with me today! I have a craft/gift show coming up on November 3 (my very first one!) and a book to read for book club tomorrow night and what did I do instead? I carved a pumpkin. Not something that should be crazy high on my priority list but something I look forward to doing every year. I’m really happy with the way it turned out! It seems our theme this Halloween is Star Wars. I’ve never been a huge fan but my husband LOVES it and asked me to make our daughter (who is almost 2) a Princess Leia costume. Hubby has taken the day off from work but wants to go in to work to show off our “mini Leia” so I thought I would make hats for he and I as well- a Yoda one for myself and an R2D2 hat for him. Our hats still need to be assembled but they’re stitched up at least. I’m a total nerd, I couldn’t wait until it was dark out to take the picture. You get the idea though.